The accommodation scene in Solo is excellent and those looking for the ultimate Indonesian holiday lodging should consider the city's plentiful homestays, where you can stay with a local family. If homestays aren't your thing, then the modern, chain hotels available in Solo are likely to be of most interest to holiday makers, being at their busiest between May and September (the dry season). Whatever the time of the year, lodging rates are rarely pricey in Solo, and mid-range hotels are certainly very affordable, especially when compared to European equivalents. For budget travellers looking for the very cheapest accommodation in Solo, the Jalan Ambon, the Jalan Carangan and the Kemlayan Kidul are all good places to look, the latter of which is home to both the Westerners Homestay and the Paradiso Guest House. As you move upwards and into the mid-range lodging bracket, you will find that most accommodation stands on or close to the Jalan Slamet Riyadi. Popular choices in this part of Solo include the Hotel Dana, the Riyadi Palace and the Novotel. Nearby and worth considering is the Ibis on the centrally located Jalan Gajah Mada, and also the Lor Inn Solo (Lor'in), which boasts luxury accommodation and some truly awesome views of Mount Merapi. 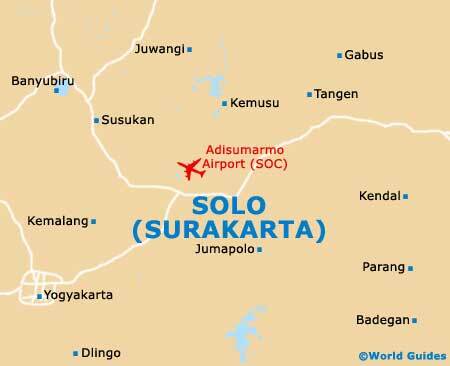 Business travellers will likely favour the Quality Hotel Solo on the Jalan Ahmad Yani, which lies 3 km / 2 miles to the west of the centre. Just a 30-minute drive away, the hotels in Yogyakarta may also appeal.